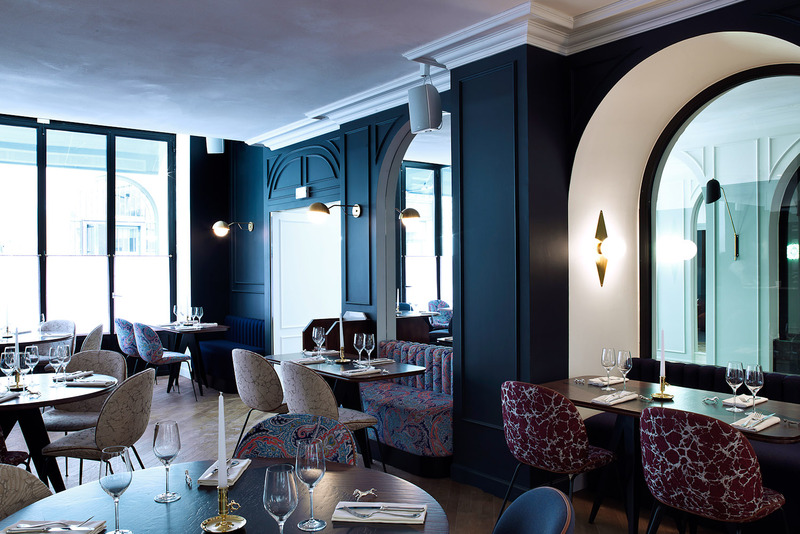 The hotel’s restaurant is a contemporary take on the traditional French brasserie. Entre nous: here, is your next Parisian bolthole. Words by Megan Arkinstall. Hotel Bachaumont was a Parisian institution at the beginning of the 20th century, located just minutes from Les Halles, then France’s largest market. However, when the markets were demolished in the 1970s, the hotel also closed its doors and this beautiful building lived out its next few decades as a hospital, and radiology and x-ray centre. Pah! Thankfully, 40 years on, a collaboration between La Clé Group and designer Dorothée Meilichzon has seen the building reborn as a splendid Art Deco boutique hotel. First impressions last. Hotel Bachaumont’s striking Art Deco entrance. It’s named after Louis Petit de Bachaumont, a writer who was attributed to Mémoires Secrets, an 18th-century chronicle disclosing sordid secrets about France at the time; but there’s nothing scandalous about the Hotel Bachaumont, its latest reincarnation a nod to the Belle Époque, the City of Light’s golden age. Meilichzon describes the hotel’s style as a fresh twist on classic Paris chic. From the moment of arrival this is apparent, with its ornate, wrought-iron entrance, high ceilings, large mirrors and a monochrome marble floor casting a striking first impression, a hint of the hotel’s pared back elegance. Each of the unique guest rooms is resplendent in serene blue hues and neutral soft furnishings, complemented by Meilichzon’s trademark headboards covered in fabric by Pierre Frey, brass Stilnovo lamps, and bathrooms that are patterned with geometric and penny-round tiles. Some rooms boast petite terraces that look over the city’s rooftops (try to nab one of these, if you can). Guest rooms are kept simple with a neutral colour scheme. 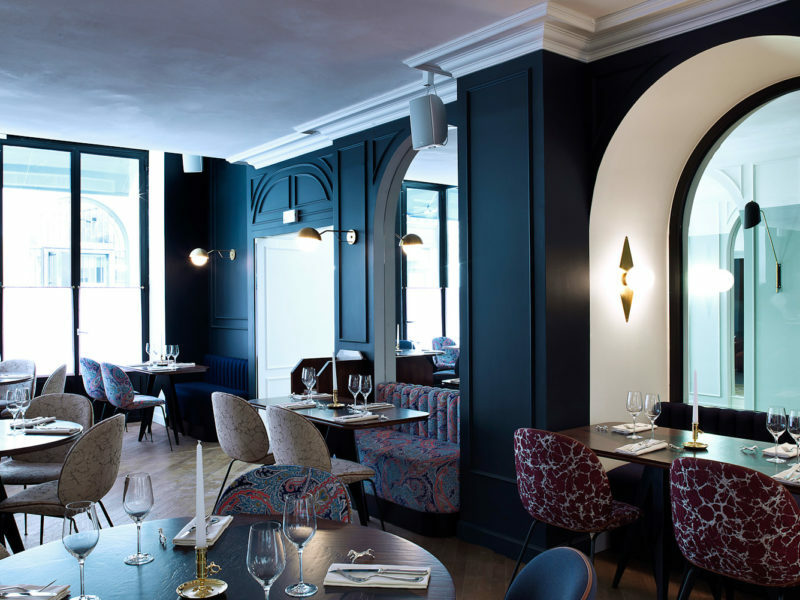 Meanwhile, the Restaurant Bauchaumont is an eclectic take on a traditional French brasserie, with a wonderful glass ceiling, wood-panelled walls, brass fittings, a brilliant clash of brightly printed fabric chairs, and backgammon-inspired dining tables. The open-plan kitchen allows you to watch as the menu of contemporary French gastronomy is prepared. But perhaps the clincher for Hotel Bauchaumont is its superb location: nestled between the Louvre and the enchanting Le Marais in the second arrondissement, this pedestrian-only zone is a haven of boutiques stores and bustling cafes, perfect for exploring by foot (so no need to use the hotel’s gym to work off those pastries, non?). The epitome of old-world Parisian charm and romance, Hotel Bauchaumont will delight nostalgics, but also possesses the right amount of contemporary cool for hip young things, too. De rien, dear reader.